It's good to be the entertainment king. Disney (NYSE:DIS) stock is back above $100 a share, having jumped almost 20% over the past 3 months. Below, we'll look at the key operating trends that helped push the entertainment giant to record highs despite expectations for weaker earnings growth in 2017. 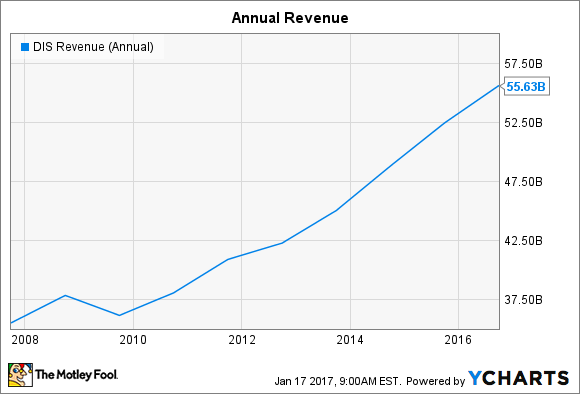 DIS Revenue (Annual) data by YCharts. Disney in early November closed the books on its sixth consecutive year of record results, with revenue rising 6% to nearly $56 billion. Its media networks division, home to the struggling ESPN business, posted just a 2% uptick to mark a sharp slowdown from the prior year's 10% bounce. However, the media giant more than made up for that weakness with growth in other segments. Parks and resorts kicked in a 5% increase but the studio segment was the real standout. Revenue spiked 28% as Disney enjoyed blockbuster theatrical hits across its key production studios of Marvel, Lucasfilm, Pixar, Disney Animation, and Disney Pictures. Four of its films crossed $1 billion in global receipts on the way to making it the leading movie maker in the world for the first time since 2003. DIS Net Income (Annual) data by YCharts. Disney's earnings are rising at a faster clip than revenue. 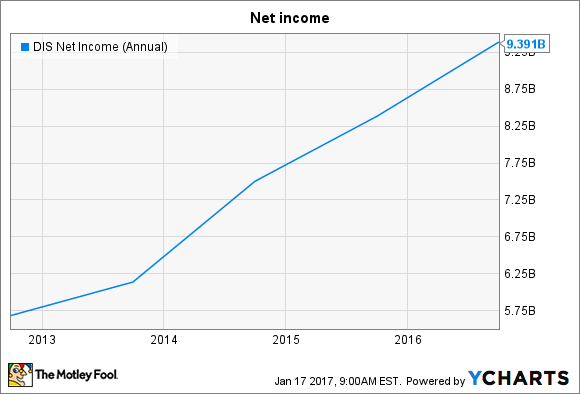 Net income jumped 12% over the past year and is up almost 80% since 2011. The studio segment was again the biggest contributor to this result in 2016, as profits spiked 37% there. That win helped offset a media networks segment that endured flat earnings growth while parks and resorts grew by 9%. Thanks to a declining share count, Disney's per-share result is even stronger, with earnings rising 17% to $5.73 per share. 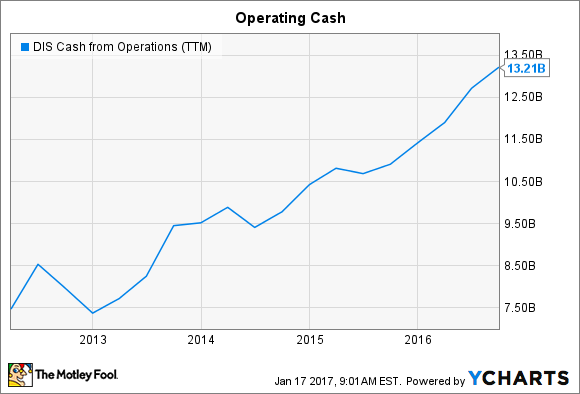 DIS Cash from Operations (TTM) data by YCharts. The House of Mouse generated $13.2 billion of operating cash in the last year -- up 21% over the prior year. This mountain of cash provides "tremendous flexibility to make key investments to expand our existing businesses, capitalize on new growth opportunities and return capital to shareholders," an executive pointed out in a recent conference call with investors. One of the biggest growth investments Disney made in the past year was its launch of the Shanghai Disney park that's situated within a four-hour drive of over 300 million people. "It would be as if the whole population of the United States could afford a ticket to Orlando and could get there within 3.5 hours no matter what transportation they used," CEO Bob Iger said while explaining why management is so excited about the long-term prospects for this resort. 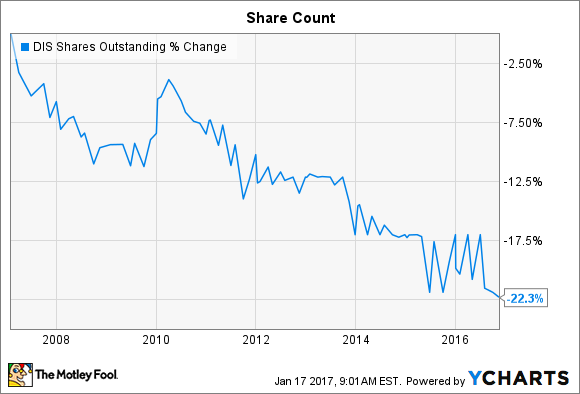 DIS Shares Outstanding data by YCharts. Disney spent $7.5 billion on stock repurchases in the past year, or about three times its annual dividend commitment. The buybacks have helped push the company's outstanding share count lower by 11% over the past five years and by 22% over the last decade, supercharging per-share earnings growth in the process. Management's ramped-up repurchase spending seems to have worked out well, given that the stock has almost tripled over the past five years. 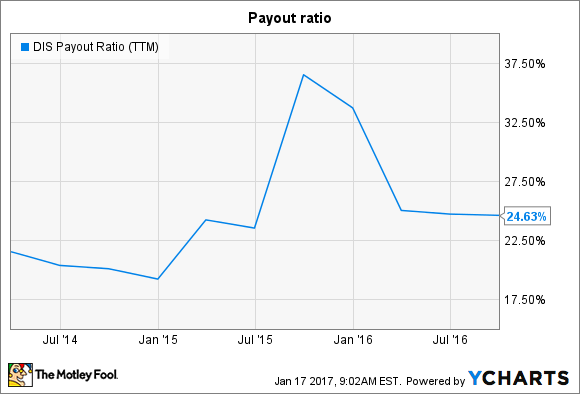 DIS Payout Ratio (TTM) data by YCharts. The dividend has more than doubled in five years, but Disney's yield and payout ratio put it behind rivals in the income department. In fact, at just over 1%, it is one of the lowest-yielding stocks on the Dow. The company commits just one quarter of profits to shareholders as dividends, too, compared to the 50% that other blue-chip giants routinely deliver. Shareholders should be happy with the skimpier payout, though, because Disney has shown a knack for making high-return investments in the business. In the coming years, investors should see the financial payoff from many of those projects, including expanding room availability at its parks and resorts and major Star Wars-themed additions to these properties. A stacked movie release schedule, meanwhile, should keep the company near the top of the global studio rankings while introducing new intellectual property that executives can then mine for increased earnings across Disney's diverse entertainment empire.